Sustain. If you ‘do' it well enough, being a fan of music, in general, can be a very rewarding experience. Besides just being able to listen to a wide variety of good music and benefiting from all of the good that it may do for you, what inevitably happens is that you begin to build these incredible moments which you not only attach to certain sounds or individuals, but to your life as well. For example, if I were to ask you to think of your favourite song, after lamenting the fact that you have to just pick one, when you eventually did, whichever it is you that choose will surely have some type of connection to your life. Be it a single moment or a specific time around when you first heard it or something which is ever evolving and you may even be able to discuss that right now as a still developing reason why it is #1 for you. Even more vivid, perhaps, would be the best concert you've ever been to, as you shared that moment with multiple you's and had this joyous occasion. When you take this view of some of your favourite artists, the link, hopefully, is defined inherently by a particular amount of evolution or at least it is for me. I can talk to you endlessly about how Soca music so wonderfully helps me connect to my children (I'm a very, very old thirty-five years old, but if you put on the right song at the moment (currently that tune is ‘Godzilla' by Skinny Fabulous) I will drop everything instantly and jump and lose it like a teenager and do so happily!) and how I envision being in my seventies with a pair of busted hips and repaired knees, still trying to jump up and wave with my grandchildren and I look forward to it! Similarly, I attach the prime years of Sizzla Kalonji to a point in my life, my young adulthood, where I desperately needed to make some changes and how much it helped me to get through those times. That lingers to this day where, with or without expectations, high or low, there remains a faint glow surrounding anything Sizzla does to my ears because I know where the ceiling is and how powerfully elevated it can be. And there're others such as Beres Hammond where my tastes finally began to cross those of my Wife's (so brilliantly extended by whom??? We call her Lugo. Sara Lugo) and even people like Turbulence whose career, in my mind, has been one of the most interesting, for better or for worse, of the modern era of Reggae music. With that being said, however, I think that when it comes to music making links in life, outside of Sizzla Kalonji, for me, that next great step comes when I learned that… yeah, I was getting older and in doing so, I realized I had suddenly become capable of tip-toeing, gingerly, through the musical kingdom known as Midnite. …because it didn't use to sound like this. When I was younger, I heard skeletons. I heard obscure. I heard confusion. I heard no melody or harmony. I saw strangely intentionally misspelled song titles and wondered why (I still those, biggup 'Daughtaz & Sunz', but I just don't care anymore) and I saw a whole heap of curiously attached fans who were clearly very, VERY far ahead of me at the time and had limitless passion for something I didn't even comprehend. Unfortunately I also saw a few albums come and go that I had picked up and passed on to others for lack of quality (could have saved some money in buying some of them for the second time later). But I just didn't get it. I didn't hear what they did. However, it is years later and OBVIOUSLY things have changed as I actually did pause for a second or two when I learned what had become of my suddenly precious 'Midnite'. It was only a "second or two" because I had a feeling that not much was going to change. Last year, after spending the last few years crawling into my head to the point where 'their' music had become a part of daily and sometimes hourly routine, the Virgin Islands powerhouse had re-identified 'themselves' as AKAE BEKA. In retrospect, it actually seems as if many of their fans had a similar reaction as I did. I was curious but ultimately I was convinced that as long as THE principal had remained, that not much would change. Of course I'm referring to Vaughn Benjamin whose name had virtually blended into the Midnite. Anytime you saw 'featuring Midnite' behind a title, you knew what to expect and it was a guest spot from Benjamin. Because of that, to this day, I don't think that I've ever felt compelled to take in the entire story regarding the change (though I'm pretty sure it has something to do with the permanent change of members in the full band). My entire mindset as that fan looking for something to hold on to was something along the lines of, 'okay, it's Akae Beka… can I please have a new album from Midn… Akae Beka?'. Yes, yes you can. And who became the first label to deliver such a set? It actually was not one of the Zion I Kings (that would come second) (and third) but instead it was the also entirely dependable US based Fifth Son Records, with whom Vaughn Benjamin had already produced absolute genuine magic. Those miraculous moments came wrapped up in several albums with perhaps the most noted being the double set, "Standing Ground" from way back in 2008 ["He ever was so, Jah know, He ever was so"] [BOOM! ], but more recently a pair of fantastic releases from Midnite and FSR, "Be Strong" ["Children running for nothing but the joy of creation. Ambivalent to everything but dem youth and strong"] in 2013 and definitely "In Awe" from the year prior (there was also the very solid "Momentum" and "Standing Ground" was re-released in a Dubbed out form). Those two albums, in particular, though they may have gone overlooked by many fans, have become favourites of mine and I could well make the case that "In Awe" is one of the finest sets ever featuring the work of Vaughn Benjamin. 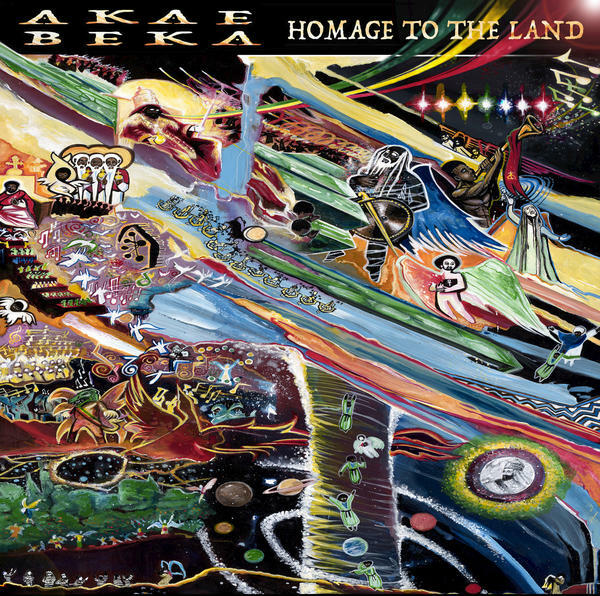 So, perhaps you'll forgive me for not having the largest reaction to the latest piece of work in this union, "Homage To The Land", as this landmark, first album from Akae Beka, but instead having the same amount of anticipation and FIRE for a the latest from a functioning artist/producer combination which has done nothing but impress and impress in recent years. There was no great musical shift and I've still yet to hear one (and will be completely surprised if ever I do) (can you imagine if Vaughn Benjamin turned… Mad Cobra one day and just started aiming at everything that moved). Instead there was more of the same mastery which had welcomed me into the next stage of my life. Let's take a listen. In contrast to the ZIK releases and those from I Grade Records in particular (although given their first effort, I suppose I need not make that distinction anymore with Zion High Productions soaring), the Midnite albums coming from Fifth Son Records are typified by a darker and more subtle sound. The results of that approach, to my ears tend to be sets which require more time to grow and would seemingly be less immediately gratifying, especially to newer fans, but hold and infinite amount of power just the same. I've recently been digging into the "Be Strong" heavily, with tracks such as 'Bless The Nest', 'Dem Kinda Heights' and especially 'Dandy Lion' having taken off even greater. In a year or two from now I'll likely be saying the same thing reference to several tracks from the most recent drop from the newly minted Akae Beka and Fifth Son Records, "Homage To The Land", from last year (and some of them are currently at the beginning of that stage which makes this a fun review to write now). And maybe one of them will be 'All We Be' which gets the album started. If you've really listened to this track -- I mean REALLY listened to it, you already know what a bona fide GEM it was. It was an absolutely scorching composition which did its own form of rising throughout its four minutes. A slow and almost delicate sound becomes this horn-heavy dynamic symphony which well compliments the vocals. Speaking of those vocals, Vaughn Benjamin shines as expected. 'All We Be' is about living up to a standard, or at least attempting to, set by His Majesty and doing your best in life (being 'all you can be'). I really like how he doesn't personalize the message WHOLLY and instead he makes the leap that it isn't only about you 'doing you', but it's also about how you treat others and have relationships with them as well because it isn't you alone walking the planet. Next up was 'Promises' which goes even further into interpersonal associations with others. My opinion of this song has been that it is a word of caution from Benjamin as he vividly paints pictures of two different types of individuals and groups of people - one of which is entirely worthy of trust and the other… not so much. Of course, he goes into great detail regarding both and even seems to finely show where they split ["It have to do with paths chosen and good choices"]. There's also a fantastically simple musical display behind that one which is well afforded its own time in the spotlight throughout. The third song on "Homage To The Land", the skyscraping 'Just Decided', is its best and DEFINITELY one of the best from Vaughn Benjamin that I have EVER heard. Prosecution say "Your honour, this ain't right"
FORGET THE MISCALCULATION, LET'S ALL REJOICE"
Such a run would have just confused me years ago and now it jumps up as such a skillful moment and you can listen to virtually any of this man's work and, while you may not LOVE everything you hear, you'll find flashes like this everywhere and I hope we all (or as many of us as possible) can appreciate that. And I have to give a musical credit here also as the riddim for 'Call Out To Jah' plays, essentially without vocals for most of the final ninety seconds of the song which is an excellent touch. For its part, 'Psalm' has a very interesting sound in both music and the kind of 'fainting' vocals utilized. Take just a superficial listen to the track and you'll hear a mountain being constructed. There is something being built there and it all comes together by songs' end. I love the free-flowing spirit behind a drop like this and given the amount of 'space' that it covers, it fits snugly and biggup the horn player here and throughout this homage. The nearly six-minutes long title track from "Homage To The Land" comes through almost as a musical mini-film. This thing has scenes and moods and action sequences and everything that you would need for a most visual experience of sound, if such a thing is possible (and it is). During the first half or so, Vaughn Benjamin tells us to give credit to those who came before us. It doesn't matter who they were in your particular case (though he will tell you), but you have to pay them the homage they deserve for setting the foundation for you. And it is the ACT of paying that respect which you brings us closer to who we are to be in this world. Later on in the composition, Benjamin basically becomes the riddim! We hear from him here and there, but this GOLDEN creation of sound which backs him takes a most appropriate and deserved center-stage and it THRILLS for nearly two and a half minutes. And this isn't the type of sound I would expect to hear on an IGR release, it is uniquely a Fifth Son Records reverberation. It's bouncy but still kind of dark and unpredictable and, every few seconds or so, some new element is introduced. AMAZING! As is his habit from time to time, 'Right Away' is a quick homage of a different kind as Akae Beka makes a stereotypically multi-faceted praise to music. I've wondered if the title might not be better printed as 'Write Away' given the fact that I'm sure I cannot possibly be the only one wondering exactly how this man writes music like this and does so ENDLESSLY. It is a very nice song, centered around this music and the nice effects it can have on those fortunate enough to receive it. Check the beautifully unifying theme of 'World Citizenship' which sets out to bring us all a bit closer through the influence of His Majesty. They see that inna HIM, is solutions a road, abroad"
For me this was a call to stop looking for things to separate one another and to really just focus on how surprisingly similar we all may be. Such a tune does a great job in complimenting the track which follows it, 'To Live', which, in its own way, serves a similar purpose. Here, the artist gives credit to and observes everything everyone does 'to get by' and 'to live' ["Make sure seh that the vendors have a niche and the people feel well-adjusted"]. Most interesting about this one is how Benjamin addresses it using exclusively the feminine pronouns. It is a very subtle touch but one which actually places extra life in the sound in my opinion. For me… say whatever you like, but things regarding PEOPLE and FAMILY just make more sense and carry more weight when they come via the Woman (things such as common sense). Finally, (yep, that's it) (more on that in a minute) closing out "Homage To The Land" is the downright ROYALLY vibed 'Cone' which I hold as one of its signature moments. Listen to 'Cone' with one ear, pay it very little attention and even in doing just that, you can tell that something very momentous is occurring. It has such compelling and gripping sound to it, that you can feel something special going on and the moment is not exhausted by the vocals. Those vocals come in with an ultra-focused and flaring sound (it almost reminds you, if you remember him, of Jah Rubal) (biggup Jah Rubal) (had an album years ago called "Fire Chariot", probably isn't too difficult find still) and, in my head they essentially pick up where our title track stopped. This is a tune about being respectful and mindful of things that happened in the world (and are still happening) before WE got here. It is giving credit to just how far we have come, as a species, over the years and just how necessary it is for You and for I to continue to make a similar level of progression. It is one of our greatest responsibilities as living and functioning human beings. Here, it sounds as powerful as ever and was utilized as a lovely bow on an awesome ["I hold His Majesty in awe"] ["In awe"] ["In awe"] gift of an album. I do want to mention that, like its two most immediate predecessors from Fifth Son Records, there're only ten selections in full on "Homage To The Land". That isn't a lot and in the age of never-ending Reggae EP's, it is a number which, on paper, fits in more like such. HOWEVER, this album, like "Be Strong" and "In Awe" is no damn EP (not that I have a problem with EP's. Biggup Ziggi). Only one tune, 'To Live' is less than four minutes long (and only by a few seconds) and everything here is STOCKED with a clear attention paid to detail and, subsequently, it all combines for a most memorable set. Overall, while I attempted to stress this point somewhat consistently here (I probably didn't do a very good job of it), I'll do it once more: MUSICALLY, this album is excellent. Again, it won't register in the same immediately digestible way as some of the other Akae Beka/Midnite releases, but even that is a bit of a 'mark'. It so completely fills the cast of albums coming from Fifth Son Records with that SOUND. The interesting bit is here: As you listen more and more to those albums, not only do they begin to explode lyrically because they are Vaughn Benjamin albums, but they also do so musically and the results are ever evolving and potentially ever expanding musical experiences. "Homage To The Land" also ranks quite well with its predecessors in terms of its quality. This is a very strong release and one which has only an upside and I can speak from experience. We didn't review this one immediately from last year (because I took a year) (biggup being nasty and sick) (or don't) and I well hold it in (awe) higher esteem now than I did a year ago. 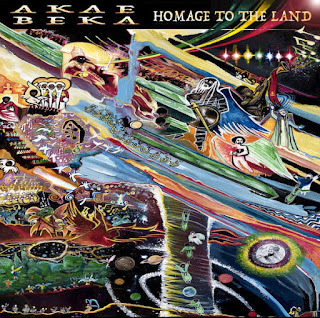 So while it may be best remembered by most as THE FIRST OFFICIAL AKAE BEKA ALBUM [! ], "Homage To The Land" was more of the same brilliance that fans have come to expect from the outfit over the years - under any name. Thanks for another great review. Seems to me that there was very little promo surrounding this album and it might have been overlooked by some fans. My appreciation for it grows every time I listen. There are some very creative ideas going on with the arrangements (strings and horns on quite a few tracks and a nice organic feel overall. 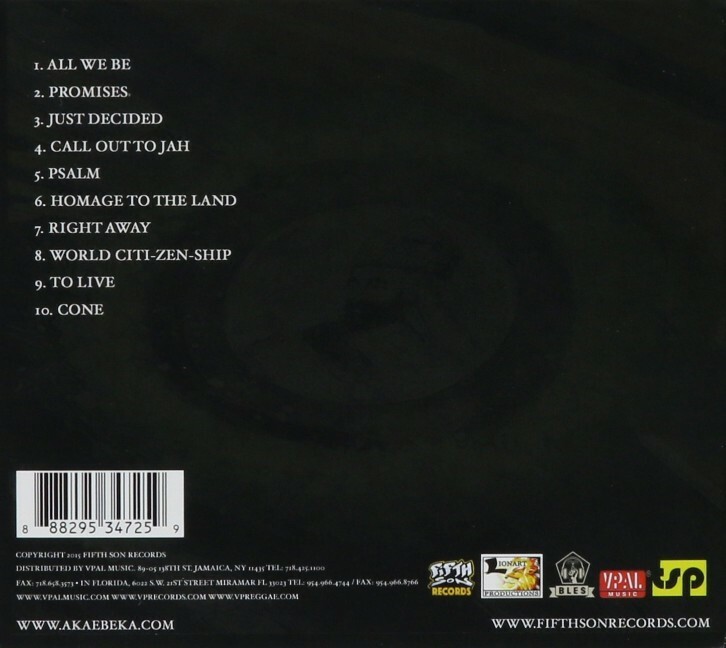 All We Be is one of the best reggae song ever. and the best album of Akae Beka is Portals without any question.